HANOVER, Pa. (WPVI) -- The Pennsylvania Game Commission's Eagle Cam is back online, offering viewers worldwide 24-7 access to live video and audio captured at a bald-eagle nest in Hanover, Pa. The Eagle Cam is provided through a partnership among the Game Commission, HDOnTap, Comcast Business and Codorus State Park. 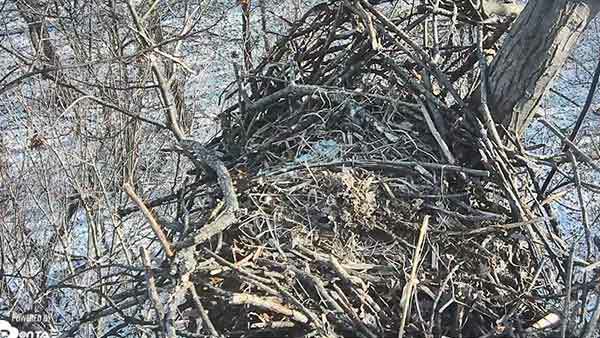 The Eagle Cam features two cameras, each equipped with a microphone, placed 75 feet high in a tree adjacent to Codorus State Park. Eagles have nested at the tree for more than a decade, and have successfully fledged young there many times. While the 2017 run of the Eagle Cam at the same tree was successful, with two eaglets hatching in March and taking their first flights in June. There was some question whether the Eagle Cam would be back at the same tree in 2018 since the nest had partially collapsed. But the adult eagles using the nest tree have rebuilt the nest and appear to have it ready for another go in the coming months. To view the Eagle Cam, go to the Game Commission's website on the Hanover Bald Eagle Live Stream link in the Quick Clicks section of the homepage. The livestream can be accessed on the page that will open.